I don't go to the movies often, but this weekend my girlfriend talked me into seeing Cloverfield. There is not much to say about a monster movie in New York. I have seen New York destroyed in movies so many different ways it is hard to find something interesting about that. 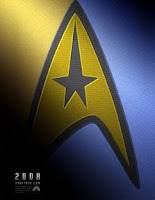 However, the best part, in my opinion, was the Star Trek teaser trailer before the movie. Like many other geeks out there, I've kept an eye on the Internet about new information pertaining to the eleventh Trek film. I have high hopes for this one. Whatever that mathematical formula is for making movies come back and do well, like Die Hard, Rambo, or Indiana Jones; I hope they apply it to this one. Sometime today the teaser should be on the official site. A version of the teaser can be found on youtube, and it is the expected quality for a video taken in the theater with a camera phone. Below I also added all three teaser posters. I didn't even know there were three already. 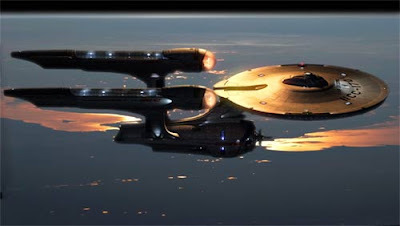 Finally, here is a confirmed fake image of the new Enterprise for the movie. It's fake because it was made by Gabriel Koerner well before the movie was in production. In any case, it's a nice picture and I would imagine the new Enterprise might look something like it.